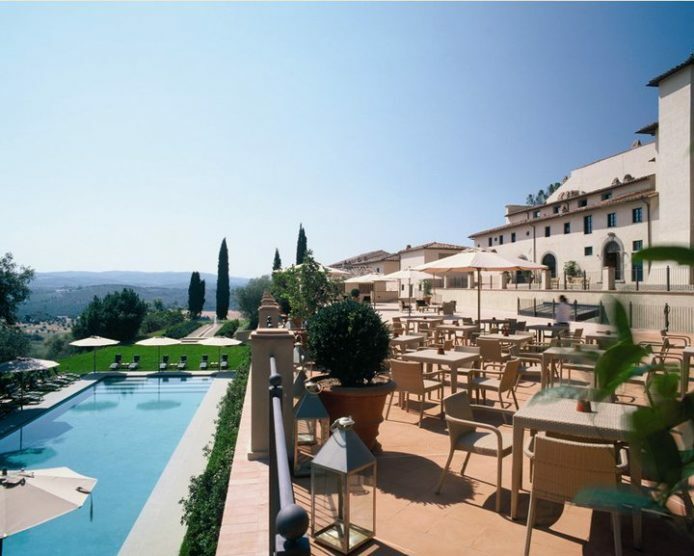 A Luxury Castle for your wedding in Chianti,Tuscany. Alessia b. Are less than 500 the structures that have the honor of being part of the narrow circle of ” Leading Hotels of the World“, the largest international organization of luxury hotels . This Castle is one of them. The reason? Imagine an authentic jewel of the XII century brought back to its original splendor by a meticulous restoration and transformed by an attention to detail that is close to perfection in a masterpiece of sumptuousness. Imagine a fairytale place where coats of arms, vaulted ceilings and frescoed walls coexist in harmony with the most advanced technology and modern comforts. And then imagine all this suspended in a valley covered since time immemorial by the poetry of artists and painters and the penetrating fragrance of the nectar of the gods par excellence. We are in the heart of Chianti, in a strategic position between Siena and Florence. The 300 hectares of vineyards and olive groves surrounding the property are lovely to prepare a romantic symbolic ceremony, but if the couple prefers the religious ritual it is hard to think of a more picturesque setting than the chapel of San Michele. The Italian gardens with ancient cypress trees, the swimming pool with adjoining cellar and the roof terrace allow to wholly enjoy the grandeur of the landscape, while in case of bad weather are available the elegant dining rooms and the fine wine cellar of the twelfth century. The 50 rooms located in the main building and annex buildings, among which 18 are suites, will let your guest live an unforgettable experience. At night, because during the day they’ll have an infinite range of services extras, including aromatic showers and baths, ballooning sightseeing tours, horseback riding and courses to learn how to cook the most famous Tuscan delights. Type of location: Castle, luxury resort. For whom: those who dream of a wedding in the exclusive golden frame of a five star hotel. Distinguishing features: The castle has a Michelin-starred restaurant, one of the best spas in Tuscany and a free shuttle service to Florence and Siena.